Let’s look at the packaging. We get it in a colored cardboard box. The range of accessories is almost complete. 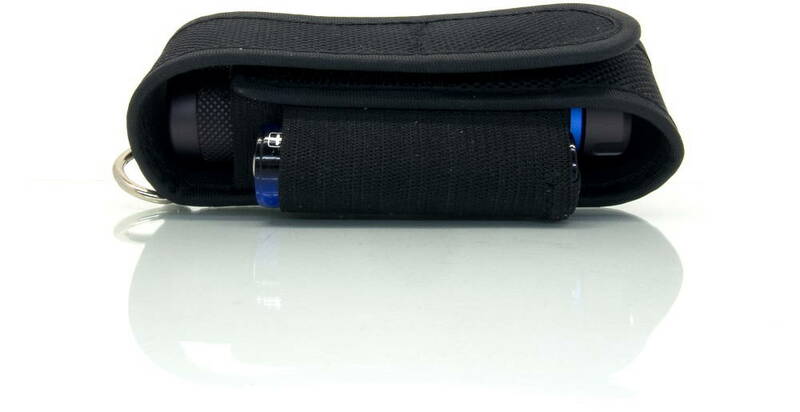 We get a 18650 battery, belt pouch, wrist strap, USB – micro USB charging cable, extra sealing rings and a stainless steel clip. The box contains a quality check card, user manual in English and Chinese. Handling is simple, but not normal. It can be switched on with a long press, approx. 3 seconds. It has a mode memory, switches on in the last used lighting mode. 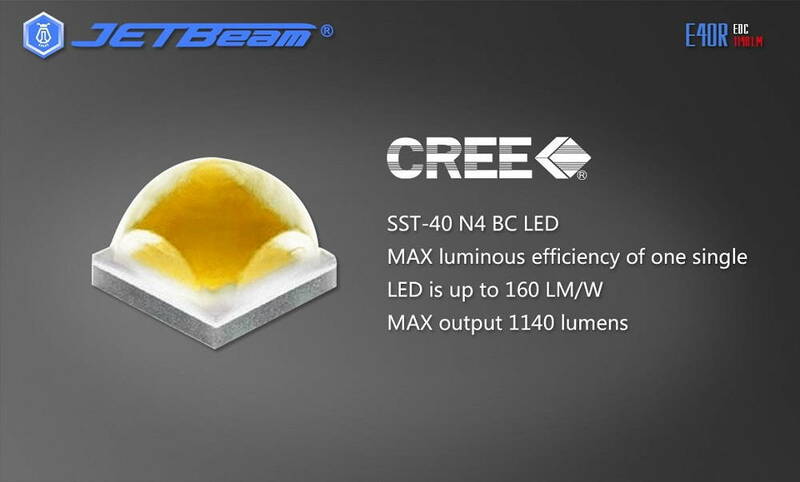 The lighting modes are turbo, high, medium, low and a hidden stroboscope. The gears do not grow in the usual direction, but the turbo mode is the first in the row, then clicking the brightness decreases. The stroboscope can be switched on with two quick cuts. When you click one, the E40R switches to the light mode in the memory. Turn it off again in a long, approx. possible 3-second push of a button. How is this? Cree or Luminus? There is a charge indicator under the metal pushbutton. If the battery is charged does not light up. If the battery voltage drops below 3.4V, it signals a green flash every second. If the battery voltage drops below 3.0V, the green light is lit up under the pushbutton, which sometimes blinks quickly. The driver has a 3-minute timing in the turbo mode, and then reduces the brightness to 65%. 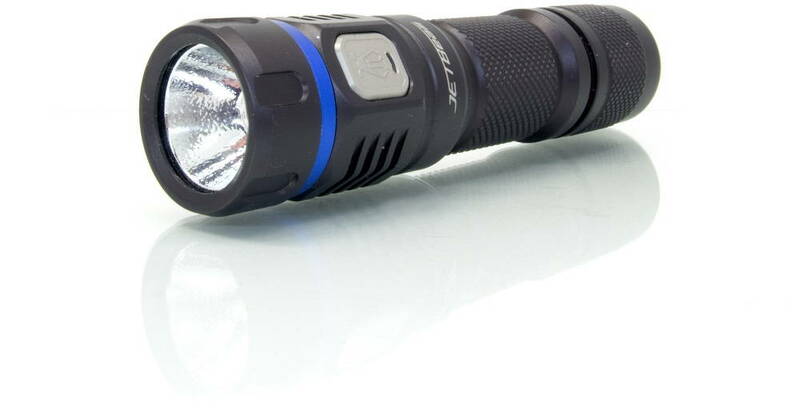 So it can not overheat the flashlight, it works fine. The built-in charger works with a micro USB connector. 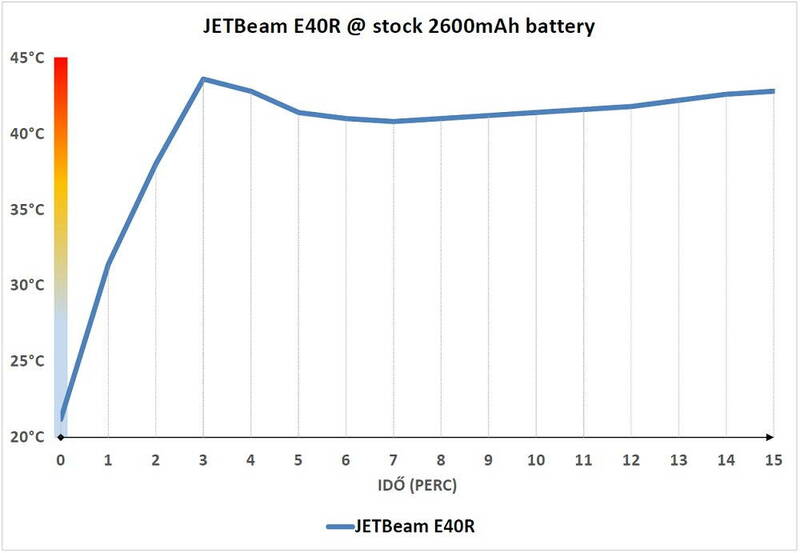 I measured the charging current at a voltage of 4.98V and charged the battery at 0.82A with the JETBeam E40R. During charging, the light under the button flashes green. When it has finished charging switches to continuous light. In the battery I then measured a 4.19V voltage, which is perfect, does not overcharge! 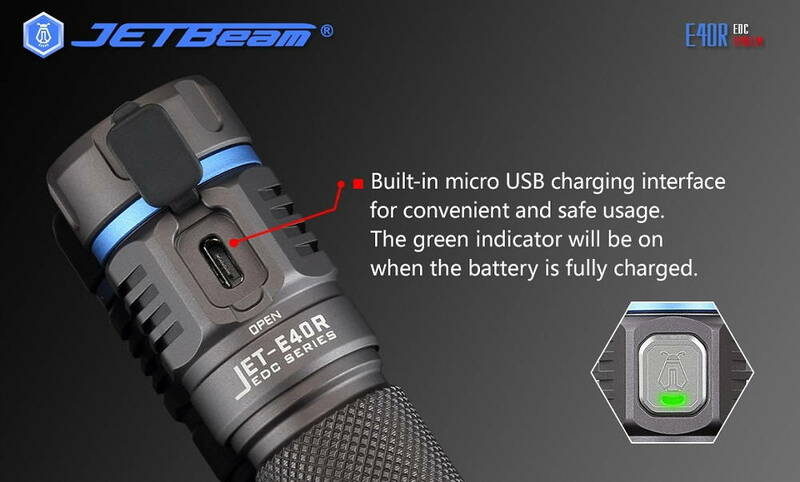 The included battery is JETBeam JL26. I did not have any information about it anywhere but a button top battery, probably with protection electronics. My measured capacity is 2587mAh, its internal resistance is 98mΩ. 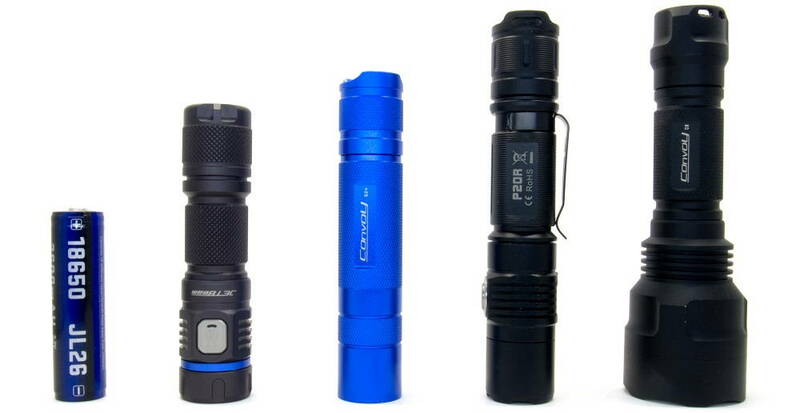 Beamshot photos are made in a familiar place with some of the more familiar flashlights. It has a fairly decent light despite the small size. In the light I did not see any PWM blinking on either stage. 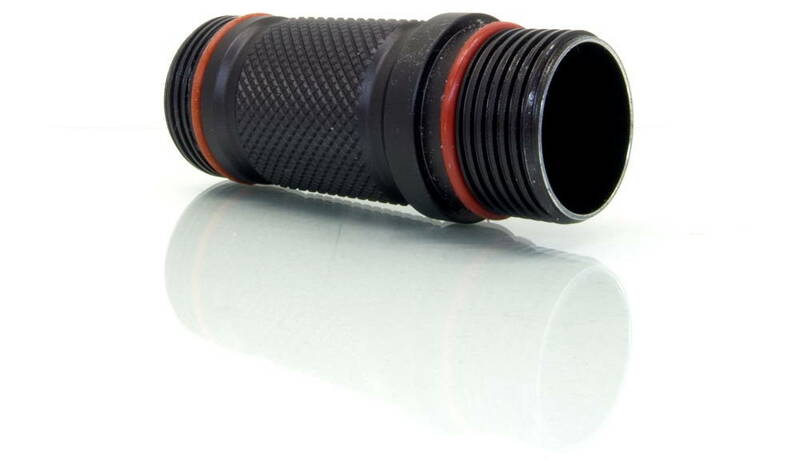 I liked this flashlight, but there are some shortcomings. I did not like the long on and off time. The attachment clip is not stable, loosened and rotates around. The button can not be locked. 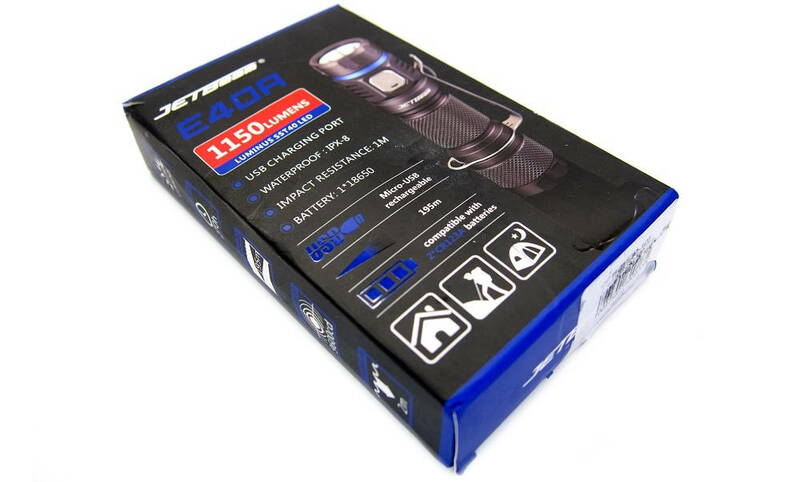 If we go beyond these, then we get a really good flashlight for all the money with all the necessary accessories. All its functions worked flawlessly, and now its price is quite friendly. Thanks for the review, good information and nice pics . This light has its shortcomings (especially the looooong press for switch-on), they were also mentioned in a youtube review that I viewed, but I still bought one (still in transit) because I really really dig the looks. Can you unscrew the bezel, and so change the emitter? Btw, it is on flash sale now, which is exactly the same price as your code. Yes, that 3 sec long press for switch-on is probably only drawback for me. Good to see you here too with reviews! Bezel ring is glued, could not be unscrewed. Thanks for the review. Yes, that 3 sec long press for switch-on is probably only drawback for me. There is an alternative, you also can double klik, you get strobe, immediately klik again and you will come in the memorized mode.